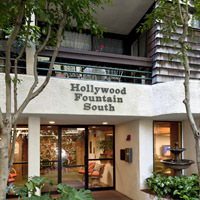 Hollywood Fountain South is a 73-unit, project-based Section 8 property located in Hollywood, CA for people 62 and over. The waiting list is currently closed. Each one bedroom unit includes wall-to-wall carpeting, vinyl flooring, central air and heating. Kitchens are equipped with gas ranges and ovens, refrigerators and ample pantry space. Other amenities include a limited access entry system and gated parking. Residents have access to a spacious community room, a computer lab, fitness room, and 24- hour laundry facility. Exterior grounds are beautifully landscaped with a courtyard and BBQ. Entertaining activities such as bingo, monthly parties, movie nights, field trips, billiards and more are regularly scheduled. Hollywood Fountain South is conveniently located near the Hollywood Bowl, theaters, shopping and the Los Angeles Metro system.